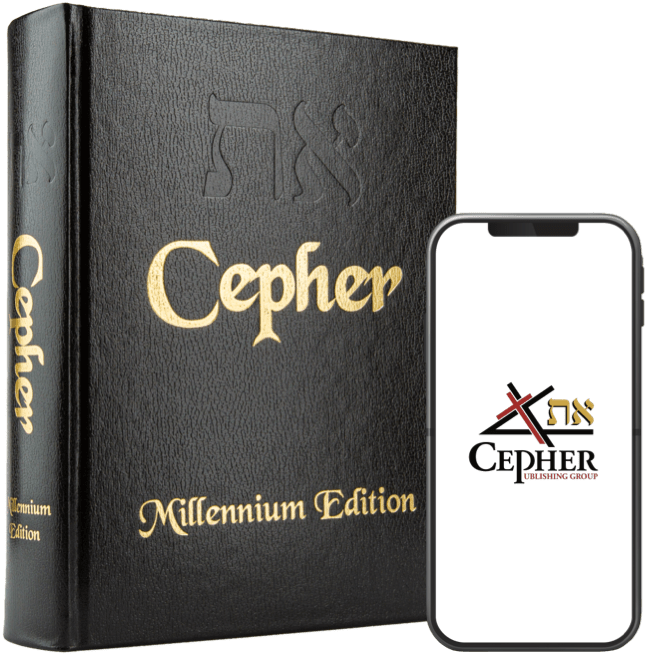 This collection of the Eth Cepher (pronounced et' seh-fare') (Divine Book) sets forth the Name of and makes references to our Creator as He identified Himself to us in His Holy Word, and restores the names of people and places found in the original Ivriyt (Hebrew) tongue which have been transliterated into English. We make mention herein of the name Yahuah (יהוה‎). The name יהוה‎ is a name that went unmentioned for over two millennia. The construct of these four letters is one that is common in modern Hebrew, where the yod is pronounced with the vowel ah, creating Yah (יָהּ). This name stands alone as Yah 45 times in the Tanakh, Ex 15:2; Ex 17:16; Ps 68:4; Ps 68:18; Ps 77:11; Ps 89:8; Ps 94:7; Ps 94:12; Ps 102:18; Ps 104:35; Ps 105:45; Ps 106:1; Ps 106:48; Ps 111:1; Ps 112:1; Ps 113:1; Ps 113:9; Ps 115:17; Ps 115:18; Ps 116:19; Ps 117:2; Ps 118:5; Ps 118:14; Ps 118:17; Ps 118:18; Ps 118:19; Ps 122:4; Ps 130:3; Ps 135:1; Ps 135:3; Ps 135:4; Ps 135:21; Ps 146:1; Ps 146:10; Ps 147:1; Ps 147:20; Ps 148:1; Ps 148:14; Ps 149:1; Ps 149:9; Ps 150:1; Ps 150:6; Isa 12:2; Isa 26:4; Isa 38:11. In Shemot (Exodus) 3:14, Elohiym gives his name as אֶהְיֶה אֲשֶׁר אֶהְיֶה (Ehyah Asher Ehyah), translated most basically as "I am that I am" (or "I will be that I will be"). יהוה then establishes the vocalization Yahuah where the vav is used in its vowel form as an “u” (oo), rather than declaring the vowel as a jot beside the consonant heh. So the yod is pronounced “yah” and the heh is pronounced with the vav as “hu” (hoo). This is easily recognized when you consider the transliterated name of many of the prophets, such as Yesha`yahu, Yirmeyahu and so on. The tetragrammaton concludes with a single heh, which carries the same jot as the yod, that is the mark ah. Therefore, the pronunciation is yah-hoo-ah, or, Yahuah. To ignore the ha at the end is a disservice (as in the pronunciation Yahweh), as the ha is the breath of the Father within His own name. This claim is supported with the following example concerning the change of the name of Avram to Avraham. Neither shall your name any more be called Avram אַבְרָם, but your name shall be Avraham אַבְרָהָם; for a father of many nations have I made you. Here, the ha is breathed into Avram, and the covenant is expressed as an everlasting covenant. The breath of life was then poured into Avraham’s wife Sarai שָׂרַי, who became Sarah שָׂרָה. Bere’shiyth (Genesis) 17:15. For this reason, pronunciations such as Yahweh, Yahveh, Yahvoh, or Yahvah are not widely disparate: Yahueh instead of Yahuah; Yahveh instead of Yahueh, however YAHUAH is the more accurate. We have set forth the name of Messiah as YAHUSHA (יהושע), partly because this name is identical to the name we have set forth in Bemidbar (Numbers) describing the Ephrayimiy Husha, the son of Nun, who was selected as one of the twelve to spy out the Promised Land during the beginning of the Exodus. Bemidbar (Numbers) 13:8 Of the tribe הטֶּמַ of Ephrayim אפרים, Hushaהוּשׁע the son בּן of Nun נוּן. Bemidbar (Numbers) 13:16 These are the names שֵׁם of the men אֱנוֺשׁ which Mosheh מֹשֶׁה sent שָׁלַח to spy out תּוּר the land אֶרֶץ. And Mosheh מֹשֶׁה called קָרָא Husha הוּשׁע the son בֵּן of Nun נוּן Yahusha יהוּשׁע. In the Masoretic text, you see the name Yahusha spelled in the Hebrew yod (י) heh (ה) vav (ו) shin (ש) vav (ו) ayin (ע) or Yahushua. Therefore, the assumption is that Mosheh added not only YAH – the name of He who visited Mosheh at the burning bush, but also added the vav to create “shua” as the ending syllable.